Statutory information – Teachers are required to supply full documentation of certifications, licenses, and proof of an academic background in their subject area. Depending on the employer, a teacher’s resume information may include background checks and additional requirements. Qualifications and experience – Qualifications requirements include a minimum Bachelor’s Degree. Teachers are required to have extensive experience in their subject, and in the case of English teachers, experience includes formal syllabus teaching and similar requirements. Name/ and contacts – Your name, and preferably phone and email contact options. Personal statement/ summary/ objectives – This section of your resume is used to introduce yourself and your work to your readers, defining your career status and goals. Skills – This is one of the most important parts of your resume. Your resume must be a good match for the skills requirements of the jobs. Pay close attention to the high value skills, which are also core job requirements, and make sure that you show strong skill sets in these areas. Formal qualifications – Double check all the documentation required for qualifications, on principle. Failure to provide evidence of mandatory qualifications will lead to your application being rejected. Employment history – Your employment history needs to clearly define your suitability for the job. Target your resume information to the new job, clearly showing your experience. If you are working on a kindergarten teacher resume, never submit a “generic” one. It will not succeed. You need to write your resume specifically for the job. This is called “targeting your resume”. You’ll find that it’s very easy to adjust a functional resume, but you will need to pay close attention to information quality and content. Remember, your application is part of a competitive process. Skills – The skills part of your resume is the “shopping list” for employers. Show your strongest skills, preferably with good performance indicators and achievements to make your application stand out from others. Experience – Another critical area for employers is experience, with good reason. As all teachers know, schools need people who can stand on their own two feet and contribute to the role. Write your resume to show how you can deliver a strong contribution to the role. For more information about becoming an English teacher and career information, see the Bureau of Labor Statistics page here at http://www.bls.gov/ooh/education-training-and-library/high-school-teachers.htm or use our resume writing services. At high school level, anticipated job growth for teachers in the US to 2022 is 6%, or 52,900. Average salary is $55, 050. The number of jobs is proportionate to the current number of English teaching positions at high school level. 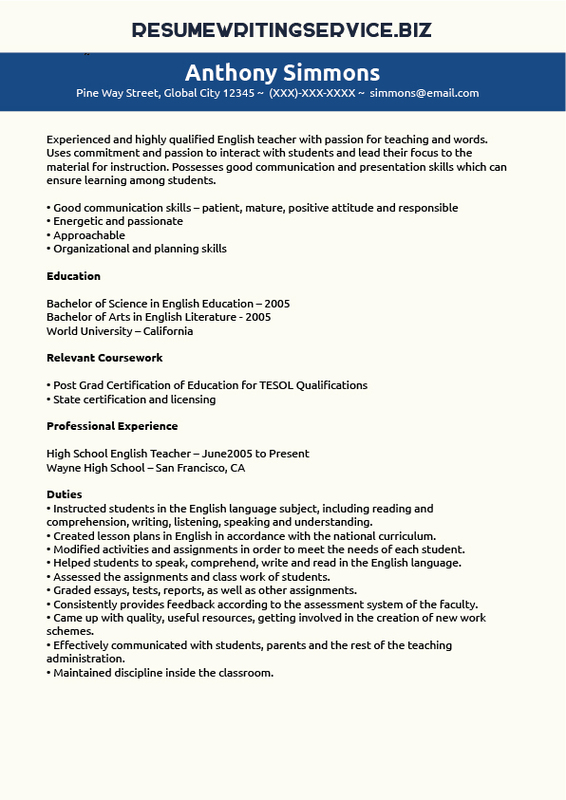 If you need help with an English teacher resume, feel free to contact us anytime!